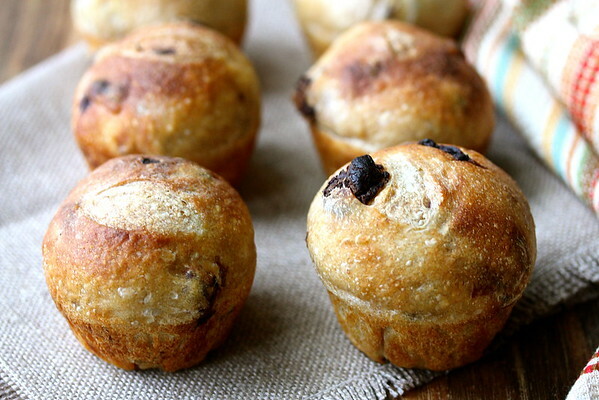 While these Dark Chocolate Cherry Pocket Breads may look like muffins, they are actually little crusty sourdough rolls baked in a muffin tin. The flavor in these mini loaves is distinctly sourdough, and the cherries and the dark chocolate unexpectedly play so well together with the sourdough flavor in these tiny babies. Yes, they could be shaped into regular loaves or rolls, but aren't these way cuter? I bake bread almost every weekend. I love the rhythm of the process. This bread fits right into that rhythm. I refreshed my sourdough starter on Friday night, created the preferment on Saturday night, and spent a leisurely Sunday mixing, shaping, and baking these rolls, finally finishing Sunday night. My only issue with this schedule is that I had to take these photos on Monday morning right before going to work. I do a lot of that.... so that big brown thing peeking out of the top of the roll that I didn't notice until now is chocolate. I used large chocolate chunks in these rolls, and some of them decided on a failed escape plan. Rest assured, the semi-escaped bits were still tasty. Is it a dessert? Is it a bread? I'd say it's an amazing breakfast bread. It's way too crusty for dessert. 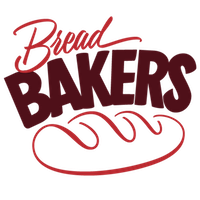 The concept of pocket breads comes from Josey Baker, a northern California based bakery owner and the author of the amazing book, Josey Baker Bread. When he was first starting his business, he developed these small loaves for potential customers who didn't want or need to buy a large loaf of bread. This was his most popular flavor. He says that his customers get upset if he runs out of them. He coats his with cornmeal, which I skipped. If you don't have time for all of the long rises, just add a small amount of yeast to the final dough to speed up the process. I've also made his Golden Raisin and Fennel Pocket Bread. If you are new to bread baking, this book will teach you how to make the most amazing artisan loaves. His enthusiasm for baking bread is amazing. After the recipe, you definitely need to check out the rest of this month's amazing #BreadBakers chocolate themed bread recipes. The theme was chosen by Shireen from Ruchik Randhap. Mix the ingredients in a small bowl, cover with plastic wrap, and let rest for about 8 to 12 hours. Drain before using. Mix the ingredients in a small bowl, cover with plastic wrap, and let rest for about 8 to 12 hours, until bubbly. Scrape the pre-ferment into a large bowl. Add the water, bread flour, salt, cherry soaker, and chocolate chunks, and mix with a wet hand until combined. Cover with plastic wrap and let rest for 30 minutes. Do four "stretch and folds" of the dough (check out this post for a video of the stretch and fold method), every 30 minutes. Cover the dough and let rise until doubled, about 3 hours. Spray a muffin tin with spray oil. Divide the dough into 12 equal parts, about 100 grams each. Form each into a ball (the dough will be sticky so flour your work surface and wet your hands). Place the dough balls, seam side down, into the cavities of the muffin tin. Cover with oiled plastic wrap and let rise until puffy, about 3 hours. Slash the tops of the breads, and spray the tops with water. Bake the rolls for 5 minutes, open the door of the oven, and spray the rolls once more with water and close the door. Bake for another 25 minutes, until nicely browned. Remove the rolls from the oven and turn them out onto a cooling rack. To make in advance, wrap with plastic wrap after they have cooled and freeze. This month we are making Breads with Cocoa, Cacao or Carob in any form. The chocolate trying to escape is really it wanting to be in the first bite. Thanks for introducing me to pocket bread and I'm putting it on my to-make list. So glad you understand Renee! 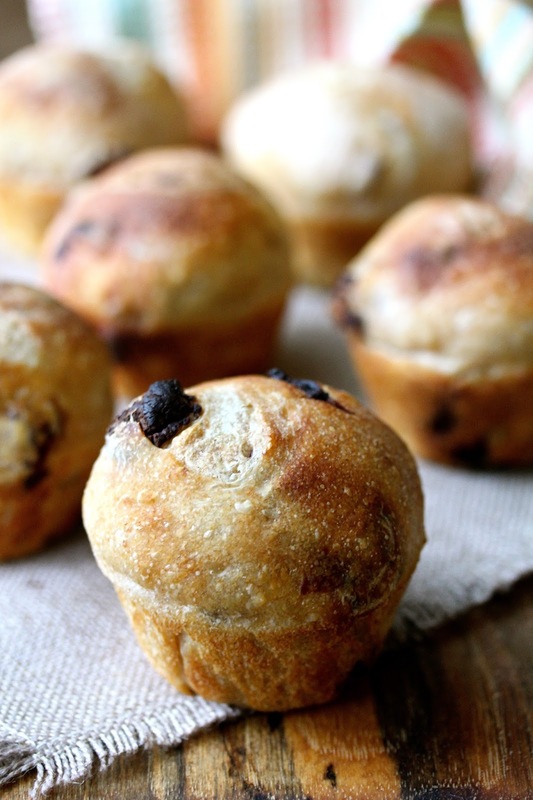 I love the idea of little muffin-sized loaves with a surprise inside. These are adorable, Karen! Pocket bread sounds wonderful! Love the choc cherry combo! These little pocket breads look adorable! First I thought they were popovers. I love the process of making bread almost more than eating it (almost). I need to get a sourdough starter going so I have it on hand when I want it. That was one of my 2016 goals. It's only March right? I'm with you on the process. Thank goodness for freezers! Pocket bread! What a fun idea... they look wonderful. What a lovely idea! Bite sized breads with a delicious filling! Love the pictures too! Thank you Shireen. That means a lot from you. Adorable pocket breads!! Cherry and chocolate together, wow that sounds wonderful! About the best combo! Thanks! Don't you love that book? Such a fun read. What an amazing idea of combining sourdough and chocolate. Also baking them in muffin pan is another genius idea. They look adorable. I love the idea of Crusty bread with Dark Chocolate and Cherries. Deadly and heart warming...they look adorable too! Love the cute muffin size rolls and also that you have used a sourdough starter. I love working with sourdough Mayuri. I am bookmarking this recipe, going to get my sourdough active. Doubled the chocolate in these and could have added more. Also, they got too dark at the suggested time in 2 out of the 3 pans - the muffin tins. Worked out ok in a cake pan.